We stayed in the flat for eight nights at the end of March. Michel met us as arranged and gave us a brief but thorough run through of the flat and its amenities. He was very apologetic that construction in the building was going on during our stay (in other units) but of course had no control over that. It was a bit noisy but only for a couple of hours a day and it didn't impact our stay at all. Michel has everything you need if you want to cook your own meals - which we did. So many utensils and pots/pans to use it was a pleasure. When we arrived there was milk, cheese, bread and other staples available for us to use. Very nice after a long flight from home! The floors are beautiful (I think mahogany) and as the unit is on the corner of the building so is filled with light. Trams are close by, the Vondelpark is right across the street and there are four excellent supermarkets close by. We will definitely recommend the location to family and friends and hope to return for another stay some day. Great apartment outside the tourist noise and crowds. 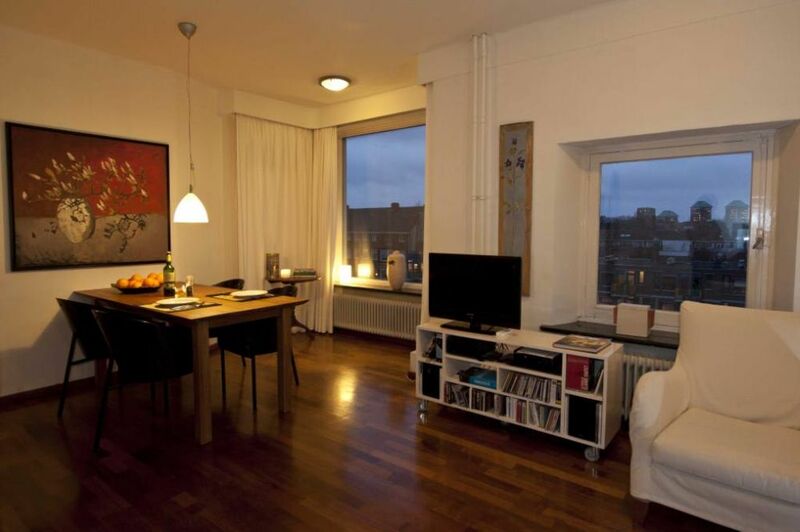 Easy walking distance to central Amsterdam. All the reviews are true. We were pleasantly surprised at how well appointed Michel's apartment is. We had stayed two nights in a hotel in the canal ring and wondered what could top that experience? Well, Michel's gracious hospitality, his comfortable, homely apartment in a very convenient location in a lovely neighbourhood certainly capped our time in Amsterdam. Michel was very prompt and responsive to my enquiries when I booked. When we arrived, he patiently answered our questions on how to get around by public transport around Amsterdam and also short trips out of the city. My husband attended a conference at the RAI and it was so convenient getting there using the tram and metro. I also made day trips to Utrecht, Haarlem and Leiden without having to go to Centraal Station which saved time. The neighbourhood is very pleasant with many fine restaurants and food shops. What we saved in accommodation costs, we spent on dining at Adam Restaurant, Parallel and Zus & Zus to name a few nearby restaurants. We also discovered Craft & Draft on Overtoom and a Belgian bar and bistro across the canal. There are so many places to eat on Amstelveenseweg and Overtoom. We counted no less than three supermarkets within a 10 minute walk from the apartment. There is also the wonderful Patisserie Linnick with its beautifully decorated cakes, pastries and chocolates. The Klopper & Stolk bakery is excellent with its range of breads and baked goods. If only we could have such a wide selection of shops in our neighbourhood at home. Michel's kitchen is well stocked if one wants to cook in. The washing machine, dryer and clothes rack (plus clothes pegs and laundry detergent) were very handy. The wifi was adequate for our needs and there was even a landline which came in handy for booking restaurants. We loved the long summer evenings spent looking out of the windows and watching the boats cruising along the canal. To echo other reviewers, we will gladly stay here again if we ever come back to Amsterdam. We really enjoyed the apartment for the 8 nights we stayed because of the combination of a number of things. It was very well represented by Michel, it fulfilled the things he said about it. It is very comfortable, a real home. The location is terrific if you want to avoid the crowds of central Amsterdam, the walk through the Vondelpark across the road to the museums is lovely, and the public transport options are extensive. There are good shopping options in the area and the apartment is well equipped for making meals. Michel is a responsive, helpful and engaging host. A great experience to go with the city of Amsterdam of which he is so proud! Very nice host who met us at the apartment and explained how everything worked. Everything you need is here, very well equipped kitchen washer dryer that are easy to use. Lovely views out of the window in the dining area of a canal that runs behind the apartment. Very comfortable bed. The apartment is located about 3 miles from Amsterdam Central station and is near two different tram lines and two markets. If we return to Amsterdam would want to book again. Easy to reach by tram 1 (stop at 200m) from Central Station or Station Corn. Lelylaan (to / from airport Schiphol)). Near the apartment there is only paid parking; center within easy reach by tram or by foot (walk through park;bicycles rental nearby.